Cost: $5 roundtrip; kids under 5 ride free. Ages 5-12 receive a 50% discount by obtaining an EASY Card from a Tri-Rail Station Agent at the West Palm Beach, Pompano Beach, Fort Lauderdale Airport, Metrorail Transfer and Miami Airport stations. South Florida residents and visitors are invited to hop aboard Tri-Rail to explore, shop, dine and play while connecting to South Florida’s most popular family friendly attractions during Tri-Rail’s annual “Ride & Play” Day on Saturday, April 27, from 11 a.m. – 3 p.m. Tri-Rail riders can show their validated train fare at regional attractions and stores in Miami-Dade, Broward and Palm Beach Counties to enjoy discounts and special offers during this exclusive promotion. Tri-Rail riders can catch a train from 18 conveniently located stations every hour on weekends and holidays. Train service is available every day of the year with bus and Metrorail connections. Tri-Rail’s weekend fares are just $5 roundtrip and children under the age of 5 ride free. Children ages 5 to 12 receive a 50% discount by obtaining an EASY Card from a Tri-Rail Station Agent at the West Palm Beach, Pompano Beach, Fort Lauderdale Airport, Metrorail Transfer and Miami Airport stations. To learn more about Tri-Rail’s “Ride & Play” or to find train schedules, visit www.tri-rail.com/ride-and-play or call 1-800-TRI-RAIL. 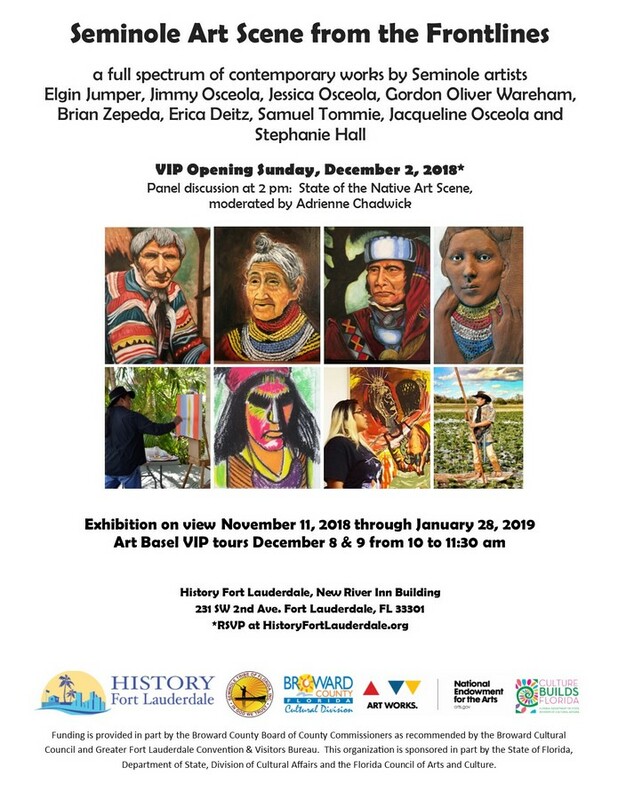 History Fort Lauderdale, proud steward of our community’s past by making our heritage accessible and engaging to residents and visitors, will present its first Art Basel VIP Event on Dec. 2 at 11 a.m. as part of “Seminole Art Scene from the Frontlines.” The contemporary fine art exhibit, honoring the history of Fort Lauderdale and the legacy of Seminole Tribe ancestors, features works from Elgin Jumper, Jimmy Osceola, Jessica Osceola, Gordon Oliver Wareham, Brian Zepeda, Erica Deitz, Samuel Tommie and Stephanie Hall. The VIP event includes an artist meet and greet at 11 a.m., a gallery tour at noon and a Projection Project performance piece by Elgin Jumper at 1 p.m. followed by a panel discussion at 2 p.m., “State of the Native Art Scene,” moderated by Adrienne Chadwick. Presented by History Fort Lauderdale, formerly known as Fort Lauderdale Historical Society, bringing the stories of our diverse community to life through engaging educational experiences, innovative cultural exhibits, research and preservation of artifacts. Residents and visitors to Fort Lauderdale are invited to explore the city’s rich past that is housed in historic buildings on a lushly landscaped campus – the History Museum of Fort Lauderdale situated in the 1905 New River Inn, the 1907 Pioneer House Museum, the 1899 Ivy Cromartie Schoolhouse Museum and the Hoch Research Library, South Florida’s foremost history center housing print resources and newspapers from 1910 – present plus 400,000 archival photos, 2,500 maps and 5,000 architectural blueprints. Museum hours are Monday – Friday from noon – 4 p.m. and Saturdays and Sundays from 9:30 a.m. – 4 p.m. History Fort Lauderdale is a nonprofit agency supported by memberships, grants and charitable contributions. Seattle-based artist LA Kennedy makes her solo debut and exhibit at The Generator Miami on December 6 & 7 with an intimate reception from 6 – 9pm both nights. Attendees will enjoy passed hors d’oeuvres, a hosted bar and conversations with the artist. Self-described as an “interpreter”, LA Kennedy is best known for her high contrast, monochromatic images of American pop culture icons. The self-taught artist draws inspiration from music legends while merging pop art influences from Jean-Michel Basquiat and Andy Warhol. Her ability to hear colors while seeing sounds, allow her to translate audio into the visual, creating awe-inspiring textured images on the canvas. The unique juxtaposition of crisp imagery and rough texture, pull you in and dare you to reach out and touch the canvas. Get on Board with SUPERFLEX: Join us on the Island Queen Cruise for a conversation with SUPERFLEX artist Bjørnstjerne Christiansen and Jacob Fabricius, curator of the exhibition, to discuss the group’s work. Boarding begins at 7:00 PM. The boat leaves promptly at 7:15 PM. This is a ticketed event and space is limited: $10 general admission; $5 students with student ID. Please make a reservation at: https://www.brownpapertickets.com/event/3819622. Artist Mira Lehr will lead a guided walkthrough of the exhibition. Lehr will answer questions and provide information related to the themes present in the exhibition and the artist’s process. The Fort Lauderdale Historical Society and BroCoMo (Bro-ward Co-unty Mo-dern) will present a Mid-century Modern Architectural Tour highlighting the historic architecture of our city and the unique works of Dan Duckham. Duckham, now in his 80s, was one of a group of trailblazing modernist architects in Florida who rose to prominence in late 1950s and 60s. His designs were inspired by the organic architecture of Frank Lloyd Wright with the fusion of the outdoors and indoors through geometric forms and construction. The tour begins and ends at the New River Inn. Parking is available at the County Garage with entrance on 2nd Street. Lunch is included. Tour leaders are from BroCoMo. Tickets are $59 per person and can be purchased at https://bit.ly/2xEE1q8. Presented by BroCoMo and the Fort Lauderdale Historical Society (FLHS), who, for 56 years, has brought the stories of our diverse community to life through engaging educational experiences, innovative cultural exhibits, research and preservation of artifacts. Residents and visitors to Fort Lauderdale are invited to explore the city’s rich past that is housed in five historic buildings on a lushly landscaped campus – the 1907 King Cromartie House Museum, the History Museum of Fort Lauderdale situated in the 1905 New River Inn, the 1905 Philemon Nathaniel Bryan House, the 1899 Replica Ivy Cromartie Schoolhouse and the Hoch Research Library, South Florida’s foremost history center housing print resources and newspapers from 1910-present plus 400,000 archival photos, 2,500 maps and 5,000 architectural blueprints. For more information about the Fort Lauderdale Historical Society (FLHS), call (954) 463-4431 or visit www.fortlauderdalehistoricalsociety.org. Follow us on Facebook facebook.com/ftlhistory on Instagram @ftlhistory and on Twitter @FLLhistory. A dance party and theatre collide for the greatest night of your life! Whether you remember exactly where you were when you heard that memorable song or event or you are experiencing it all for the first time, this show will connect you to the music and the memories. Decades Rewind is a high energy theatrical concert experience, performing Disco, Funk, Rock, Motown, and all the hits of the 60’s, 70’s, & 80’s. Featuring over 60 songs, 100 costume changes and nostalgic video that bring you back in time. Some of you will be compelled to get up and dance. Others will sing along and sway to the unforgettable sounds of rock ‘n roll history as it unfolds before your ears and eyes. All ages leave the show feeling uplifted, happy and energized by this musical journey through time. Join Friends of The Underline founder, Meg Daly for a Saturday morning talk and tour of Brickell Backyard; The Underline’s first phase to begin construction this year! Get an inside look at the future multi-use exercise court, sound and performance stage, bike trails and jogging paths and so much more coming to Brickell. Ask questions, make suggestions, get involved and get excited! This is your chance to witness the MPath in its current condition, while looking ahead to its total transformation, before the shovel hits the ground. Comfortable shoes and attire are recommended. Space is limited so sign up now! You can make a tax-deductible contribution of any amount but $10/person is recommended and very much appreciated. For more information visit www.facebook.com/theunderlinemia or email info@theunderline.org. Friends of The Underline, a 501(c)3 non-profit organization, will transform the underutilized land below Miami’s Metrorail, from the Miami River (near downtown) to Dadeland South Station, into a 10-mile, world-class, linear park and living art destination directly connected to transit. On September 9th, join us for a Sunday fun day as we explore The Underline’s connections to future and existing destinations in our beautiful city! Meet up at 9:30 AM at Dade Heritage Trust for a 10AM departure. We’ll travel through historic Coconut Grove and The Commodore Trail for a scenic Miami ride until we reach our destination at the Bookstore & Kitchen in the Grove. Feel free to join us on our ride back for a round-trip ride. Cyclists of all levels are welcomed. Helmets are required for everyone. Check out the ride route here. Love our bike rides? Join us for free, family-friendly bike rides along the MPath throughout the year. Rides are open to all bicyclists age 12 and over. Let’s show that biking is a fun, safe, and a healthy way for you and your family to discover our city … Helmets, waivers, and fun required! You can make a tax-deductible contribution of any amount but $10 person is recommended and very much appreciated. For more information visit www.facebook.com/theunderlinemia or email info@theunderline.org. Special thanks to our Cycling Club sponsor Baptist Health South Florida and our ride partners Dade Heritage Trust, Bike Coconut Grove and Friends of The Commodore Trail. Join Friends of The Underline for a Saturday of fun as we beautify our community by painting the tagged fences that border the future Underline. Sign up for an hour shift of painting and play as we celebrate The Underline, make new friends and work together to improve our neighborhoods. Paint and supplies are courtesy of Home Depot. This event is in partnership with The City of Miami and Miami-Dade County Transportation & Public Works. The specific section of the fence that we will be painting is private property belonging to homeowners in the area who have been receiving citations from the City as the tagged works are not in compliance with City of Miami Code. The Underline is a supporter of the arts and, once completed, will be a platform for public art including graffiti and street art – just in the correct areas where our neighbors are not being fined. We look forward to commissioning this art along the future 10-mile corridor as we build each phase. This event has been created to help the neighbors be in compliance with City Code. The Underline’s volunteer crew will only be painting the fence areas that are authorized by private homeowners. Should you have any questions or comments please email info@theunderline.org. Join The Underline Cycling Club and Bike Walk Coral Gables for a historic Coral Gables ride that will explore the origins of mobility and connectivity in the City Beautiful. From old trolley tracks and hidden trails to the MPath, home of the future Underline, join us as we observe the city’s transformation moving to become a greater connected community with The Underline, trails and transformative parks! Cyclists of all levels are welcome and helmets are required for everyone. This ride begins and ends at the Coral Gables Museum. NOTE: There is a $5 fee for this ride, paid on the day of the event at Coral Gables Museum. Payment also gets you full day access to the museum. Love our bike rides? Join us for free, family-friendly bike rides along the MPath throughout the year. Rides are open to all bicyclists age 12 and over. Let’s show that biking is a fun, safe, and a healthy way for you and your family to discover our city. Special thanks to our Cycling Club sponsor Baptist Health South Florida and our ride partner Bike Walk Coral Gables. Friends of The Underline, a 501(c)3 non-profit organization, will transform the underutilized land below Miami’s Metrorail, from the Miami River (near downtown) to Dadeland South Station, into a 10-mile, world-class urban trail, linear park and living art destination directly connected to transit. On October 14th, join us for a Sunday fun day as we explore The Underline’s connections to future and existing destinations in our beautiful city! Meet up at 9:30 AM at Dade Heritage Trust for a 10 AM departure. We will take a scenic ride through the historic Shenandoah neighborhood headed for our destination at Cuban Memorial Boulevard Park. Feel free to join us on our ride back for a round-trip ride. Cyclists of all levels are welcome and helmets are required for everyone. Miami Design District partners up with Arts Encounters to bring free guided tours led by art critic, Margery Gordon. Gordon leads two monthly tours to showcase the neighborhood’s public artworks. To kick off the start of the month, the Saturday afternoon excursions consist views of the entrance to the Design District, followed by a look at one of the neighborhoods indoor institutions. On the third Wednesday of each month, guests will get to visit Paradise Plaza and the parking lot work of art—the brand new Museum Garage. Don’t forget to meet in front of the Fly’s Eye Dome on the first floor of Palm Court. The event is free, but please register through Eventbrite. Join the Coral Gables Community Foundation and Dr. Paul George, HistoryMiami Museum Resident Historian, for a trolley tour of the City’s historic and celebrated thematic villages plus a special stop in a private residence in the French City Village! The Tour will begin in The Biltmore’s lobby where you’ll hear about the hotel’s history and redesign, inspired by George Merrick and his love for South Florida’s natural landscape over wine and light bites. Guests will be picked up and dropped off at The Biltmore, located at 1200 Anastasia Avenue. The Tour will begin at 1:30 PM sharp. Please arrive promptly. Proceeds benefit the Coral Gables Community Foundation. Bali, Fiji and Maui, three global getaways known for ultra-luxury resorts, were the creative inspiration behind CC Homes’ newest contemporary residences at Canarias at Downtown Doral. The trio of new Canarias luxury home models and furnished homes for sale will be showcased throughout the opening weekend of June 2 – 3, from 10:00 am to 6:00 pm with home tours beginning at the Sales Gallery, located at 8333 NW 53rd Street, Suite 102, in Doral. Canarias at Downtown Doral encompasses 130 acres and boasts 423 single-family estate homes including 52 townhomes in a mosaic of seven residential collections. Ranging in size from three to six bedroom floorplans, the single-family homes are attractively priced from $590,000 to $1.5 million, with townhomes starting at $630,000. Canarias is situated in the heart of red-hot Downtown Doral, one of the country’s fastest-growing and most international towns-within-a-city, best known for its highly regarded A+ rated charter school, lively mix of retail, restaurants, lush parks and world-class public art. First annual Biscayne Bay Beer Bash! Celebrate American Craft Beer Week this Saturday, May 19th. Experience a behind the scenes tour of the brewery and enjoy craft beer specials–see menu flyer on Facebook. Bring in the flyer and get one free beer! Event from 12pm – 1am. Adult Swim once again brightens up your summer with Adult Swim On The Green, the traveling road show bringing fans a unique pop-up outdoor screening event and more starting on May 31st . From the network known for hit series Rick and Morty, Robot Chicken and The Eric Andre Show, Adult Swim brings more laughs and more surprises this year as comedian Zack Fox serves as the tour’s new host to heckle and entertain the masses in city stops ranging from Charleston, SC to Minneapolis, MN. Fans will experience a fun-filled evening and enjoy the tour’s new features that include a beer and wine garden, all-new games and activities such as the GEICO® Gecko pond, where players can test their luck and get rewarded with Adult Swim freebies presented by returning sponsor GEICO®. Local vendors will also be part of the tour and guests can get their hands on exclusive Adult Swim merchandise not sold in stores or online. Also new this year, fans can now vote for their favorite episodes for the chance to see them at the event. Attendees can also upgrade their experience with the On The Green Package, that includes unlimited popcorn, exclusive giveaways and their very own lawn chair to enjoy during the screening. Adult Swim On The Green will include a free promotional screening of “Things You May Have Never Seen,” a sneak peek of what’s to come, including unaired Adult Swim episodes, never-before- seen pilots, specials and more Williams Street favorites all shown on the massive custom LED wall under the stars. Admission is free for guests 18 years +. Entry confirmed with purchase of a concessions voucher good towards 1 free popcorn and soda. Go to adultswimpresents.com for details. The 2018 #AdultSwimOnTheGreen tour dates and locations, with more stops to be determined. #MiamiWalks is part of a global walking movement known as Jane’s Walk, and is proud to be an anchor initiative of the 2018 #10DaysofConnection! Our neighborhood exploration of South Miami will be led by Mari Chael, who’s the former President of South Miami Neighbors, along with being an avid fan of walking, biking, and transit. She’s excited to lead a walk in South Miami’s downtown area for a second time during Jane’s Walk annual weekend! This walking tour will be a nice stroll through the community and take stops at delectable culinary destinations. Accessibility: #MiamiWalks seeks to make this event as accessible as possible to individuals of all different abilities and needs. This walking tour in particular, will be kid-friendly, dog-friendly, and ADA-friendly. Contact: For questions or in need of additional accommodations, please send an email to celebratediversitymiami@gmail.com at least 24-hours in advance of the event. Our neighborhood exploration of Hialeah will be led by Ariana Hernandez-Reguant, who’s a cultural anthropologist and have been conducting ethnographic research in Hialeah on immigration, citizenship and popular culture for a many years. She is also HICCUP’s founder, the Hialeah Contemporary Culture project. This walking tour through East Hialeah’s residential streets will focus on reflections of immigration, labor, culture, power and wealth. The ultimate question is: Can Hialeah be gentrified…? Stops along the way include: the new Leah Arts District, as well as a traditional Cuban restaurant, several religious and cultural landmarks. Accessibility: #MiamiWalks seeks to make this event as accessible as possible to individuals of all different abilities and needs. This walking tour in particular, will be bi-friendly (Spanish). Our other neighborhood exploration of Brickell will be led by Allison McComb, who loves to walk, explore and share Miami from the perspective of a born & bred Miami Girl! She also runs the blog, MiamiGirlWalking.com. This walking tour will have you looking up, down, and all around at glimpses of Miami’s new and old development throughout Brickell. Starting off at Brickell City Centre, additional stops along the way include: historic Miami Circle and a variety of inspirational artistic structures. Accessibility: #MiamiWalks seeks to make this event as accessible as possible to individuals of all different abilities and needs. This walking tour in particular, will be dog-friendly. Our neighborhood exploration of Brickell Avenue will be led by Casey Piket, who’s the founder of a popular Facebook page “Miami History” and the official walking tour guide for Dade Heritage Trust, Miami-Dade County’s leading organization committed to preserving local architectural, environmental, and cultural heritage. This walking tour is part of an on-going series that touches on the architecture, history, culture and environment of Brickell. It’s fun, heart-healthy, educational & entertaining, while featuring great views along Brickell Avenue North and the Miami River walkway! You’ll get to know more about this local community with stops at a variety of places of interest along the route. Accessibility: #MiamiWalks seeks to make this event as accessible as possible to individuals of all different abilities and needs. This walking tour in particular, will be kid-friendly and dog-friendly. Our neighborhood exploration of Overtown will be led by Connie W. Kinnard, who’s been a Miami resident for 3 years now. She’s happy to be marketing & promoting this multicultural and diverse community through efforts of the Greater Miami Convention & Visitors Bureau! This walking tour starts at the Historic Lyric Theater where the Historian & Executive Director of the Black Archives will meet attendees to share about Overtown’s key history and other multicultural gems in the area. Stops along the way also include: Ward Rooming House, the Old Clyde Killen’s Pool Hall, Black Police Precinct and more. Accessibility: #MiamiWalks seeks to make this event as accessible as possible to individuals of all different abilities and needs. This walking tour in particular, will be kid-friendly. Our neighborhood exploration of Allapattah will be led by Mileyka Burgos, Co-founder of the Agency for Community Empowerment (ACE), whose mission is to empower people, celebrate culture, and develop communities that foster sustainability, identity & economic development. This is a walking tour along the streets of Allapattah, an undiscovered historic neighborhood in the civic center of Miami. Allapattah has as mix of industrial, commercial and residential streets. During the walk we’ll talk about its history, diversity and continuous transformation. The walking group will also visit local shops, historic locations, and discuss the issues that affect this area. Accessibility: #MiamiWalks seeks to make this event as accessible as possible to individuals of all different abilities and needs. This walking tour in particular, will be kid-friendly and bi-lingual (Spanish). Our neighborhood exploration of Miami River will be led by Anneliese Morales, a Miami native, avid community activist & volunteer coordinator who’s determined to make Miami the best it can be. This walking tour will focus on the riverside history in East Little Havana. Starting by the mouth of the Miami River, where this area began thousands of years ago, our group will explore the roots of Cuban migration at Jose Marti Park, once known as “Tent City.” Stops along the way include a cluster of designated historical sites such as the Miami River Inn and the Miami Hispanic Cultural Center, also known as the J.W. Warner House, a landmark built in 1906. Discover these sites and learn more about the Miami River Greenway, a waterfront linear park, becoming the next multicultural public space connecting Miamians! Accessibility: #MiamiWalks seeks to make this event as accessible as possible to individuals of all different abilities and needs. This walking tour in particular, will be kid-friendly, dog-friendly, bi-lingual (Spanish), and ADA-friendly. Our neighborhood exploration of Wynwood will be led by Urban Adventures, which offers unique, super local experiences that truly connect Miamians and visitors with our communities. Art + beer = a great combination, right? This walking tour will discover the amazing street art, galleries, and breweries that make Wynwood such an iconic Miami neighborhood. You’ll even get to see some of the more hidden murals by world-renowned contemporary artists. Stops along the way will include: neighborhood favorites for a snack and/or some coffee, plus two local breweries where you can order a taste of the wonderful brews being crafted locally. Accessibility: #MiamiWalks seeks to make this event as accessible as possible to individuals of all different abilities and needs. This walking tour in particular, will be kid-friendly, bi-lingual (Spanish), and ADA-friendly. Our neighborhood exploration of the Design District will be led by Margery Gordon, a journalist, educator and curator from Arts Encounters, who was raised amid Dade County’s cultural development, bringing interactive experiences and guided tours of art & design destinations to South Florida that enlighten, engage and connect participants. The Miami Design District is a vibrant area dedicated to innovative architecture, design, art, fashion and dining. This walking tour delves into the area’s evolution from a historic regional hub for home furnishings to a world-renowned showcase for cutting-edge art, design, fashion and culinary experiences. Stops along the way include Buckminster Fuller’s retro-futuristic Fly’s Eye Dome, and Sol LeWitt’s monumental block towers reconstructed this winter. Attendees will learn about the creative process of such influential visionaries, plus key movements and emerging trends in contemporary art and urban planning. Our neighborhood exploration of Doral will be led by Ann Ryan, a resident there since 2011 who volunteers with the Guardian Ad Litem program, enjoys taking nature photography, plays trivia and loves dogs. She also works as a real estate agent. This walking tour will consider the concept of new urbanism and how we can make cities more “livable.” Doral has gone from a sleepy suburb to a thriving hub in just a few years! Come and see a few of the new areas that have sprung up. Stops along the way will include: Downtown Doral Park, City Hall, Downtown Doral shopping and residential developments, Carnival Cruise Headquarters, and City Place. Accessibility: #MiamiWalks seeks to make this event as accessible as possible to individuals of all different abilities and needs. This walking tour in particular, will be dog-friendly and bi-lingual (Spanish). Our neighborhood exploration of North Miami will be led by local residents Erika and Ilyana, along with fellow members of the Greater North Miami Historical Society, which works to preserve the history of their community and its surrounding areas. This walking tour is focused on creating a conversation around how to make North Miami more walkable, vibrant, and welcoming. Starting off at the Museum of Contemporary Art, additional stops along the way include: small businesses & nonprofits, residential developments, park spaces & cultural amenities, plus potential sites for new construction. Accessibility: #MiamiWalks seeks to make this event as accessible as possible to individuals of all different abilities and needs. This walking tour in particular, will be kid-friendly, dog-friendly, bi-lingual (Spanish) and ADA-friendly. Another neighborhood exploration of Little Havana will be led by The Underline’s Cycling Club, powered by Baptist Health South Florida. The Underline is transforming land below Miami’s Metrorail system into a 10-mile, world-class, linear park and living art destination directly connected to transit. Their tour will explore connections to future and existing destinations in our beautiful city, while showing how biking is a fun, safe, and healthy way to get around! Starting at the Douglas Road Metro, this family-friendly bicycle ride travels to Little Havana for some snacks & refreshments. Stops along the way include opportunities to learn about transit-oriented development, and how local residents are living healthier & more mobile lifestyles. This ride is open to all bicyclists 12+ years, plus requires a helmet and waiver to participate. Accessibility: #MiamiWalks seeks to make this event as accessible as possible to individuals of all different abilities and needs. This tour in particular, will be kid-friendly. Contact: For questions or in need of additional accommodations, please send an email to cycling@theunderline.org at least 24-hours in advance of the event. Description: #MiamiWalks is part of a global walking movement known as Jane’s Walk, and is proud to be an anchor initiative of the 2018 #10DaysofConnection! Our neighborhood exploration of Downtown Miami will be led by Shaan Patel, a trained Architect who’s working as a developer, and is passionate about city planning. He’s also the creator and writer of Miami Grid, a local blog about Miami Urbanism. This walking tour will consider what the boundaries or arteries of Downtown Miami are, while delving into the area’s history of development. When looking at the western part of Downtown today, most do not know the history or changes that this segmented community has undergone. While learning about the Miami River, Flagler’s Railroad, and the introduction of I-95, this walking group will weave through a changing place to better understand why it is the way it is, and where it’s going. Stops along the way include: Historic Lyric Theater, Miami Central, and and Lummus Park. The tour will also end with free entry to HistoryMiami Museum’s “Street Traditions” exhibit! (plus service fees) and are available at https://bit.ly/2qo3iAf. Presented by the Fort Lauderdale Historical Society (FLHS), who, for 56 years, has brought the stories of our diverse community to life through engaging educational experiences, innovative cultural exhibits, research and preservation of artifacts. Residents and visitors to Fort Lauderdale are invited to explore the city’s rich past that is housed in five historic buildings on a lushly landscaped campus – the 1907 King Cromartie House Museum, the History Museum of Fort Lauderdale situated in the 1905 New River Inn, the 1905 Philemon Nathaniel Bryan House, the 1899 Replica Ivy Cromartie Schoolhouse and the Hoch Research Library, South Florida’s foremost history center housing print resources and newspapers from 1910-present plus 400,000 archival photos, 2,500 maps and 5,000 architectural blueprints. For more information, please call (954) 463-4431 or visit www.fortlauderdalehistoricalsociety.org. Follow us on Facebook at facebook.com/ftlhistory on Instagram @ftlhistory and on Twitter @FLLhistory. Our neighborhood exploration of Little Havana will be led by Corinna Moebius, a local resident and co-author of the book, “A History of Little Havana.” She’s been leading tours of Little Havana since 2006, when she served as director of the monthly Viernes Culturales festival, and is currently a PhD Candidate in cultural anthropology at FIU, where her research focuses on racial politics of the community’s memorial landscape. This walking tour is not an ordinary experience of Little Havana. There will be highlights of the popular “arts district” or “heritage district” on Calle Ocho, but you’ll learn how to “see” the district as a stage. How does it function as a stage? What stories are told here, and why? Where and what are the silences? Attendees are encouraged to think critically about the role of “heritage districts” and “heritage tourism” in reproducing myths about race/ethnicity and racial/ethnic difference. Stops along the way include: Cuban Memorial Park, murals, Domino and Azucar Plazas, and some sites outside the tourist district as well. Accessibility: #MiamiWalks seeks to make this event as accessible as possible to individuals of all different abilities and needs. This walking tour in particular, will be kid-friendly and dog-friendly. What is Coconut Grove becoming? Our neighborhood exploration of Coconut Grove will be led by Hank Sanchez-Resnik, who’s the Founder & President of Bike Coconut Grove, and has been a homeowner and resident there since 2013. This is a walking tour of the commercial heart of Coconut Grove, which is currently undergoing major developments. There will be stops at several key locations where new buildings are being built, older buildings are being remodeled, and a new vision of the Central Grove is emerging. Along the way, our walking group will talk with planners and developers who are behind the changes. Accessibility: #MiamiWalks seeks to make this event as accessible as possible to individuals of all different abilities and needs. This walking tour in particular, will be ADA friendly. Our neighborhood exploration of Shenandoah will be led by Kiki Mutis, who’s originally from Colombia, has worked in the environmental education world for 20+ years, and currently works at Fairchild Tropical Botanic Garden. This is a walking tour under Shenandoah’s tree canopy, starting at Shenandoah Park. The group will meander along the streets to discover the roots that bind a community together, and learn what our birds & butterflies are yearning to share. Become more knowledgeable about trees & shrubs, and get inspired on how to make your yard a Florida-friendly one. Accessibility: #MiamiWalks seeks to make this event as accessible as possible to individuals of all different abilities and needs. This walking tour in particular, will be kid-friendly, dog-friendly, and bi-lingual (Spanish). 10 Days of Connection is a community-led initiative to promote kindness and inclusion in Miami-Dade and Broward counties. From May 1-10, participants are invited to attend connection experiences hosted by more than 130 local organizations, and are challenged to step outside of their comfort zone to forge new connections across lines of difference. A full calendar of events is available at http://bit.ly/ConnectionEvents. Join the conversation by following @ConnectMiami305 on Facebook, Twitter, and Instagram, and by using the hashtag #10DaysOfConnection to share your experience. Learn more at 10daysofconnection.org. This weekend, Miami serves as the launch for the eight-city “Qatar Roadshow” tour. The Roadshow will bring a one-of-a-kind experience straight into a number of America’s largest cities. Complete with interactive sporting elements, a taste of Qatari food, and a look at its cinematic legacy, the Roadshow will open up the eyes to all those who attend. Little Haiti Cultural Complex and the Caribbean Marketplace present Caribbean Market Day every Saturday of the month from 10am to 6pm in the Caribbean Marketplace in Little Haiti and will showcase original Afro-Caribbean entertainment, fashion, cuisine, accessories, jewelry, shoes as well as homeware, natural beauty products, books, music, arts, culture and more. The Caribbean Marketplace (or Mache Aysisyen in Haitian Creole) was designed by architect Charles Pawley as a modern day replica of Haiti’s iron market. With its bright pastels, pitched tin rooftops and decorative latticework, it transports visitors to the island. Inside, the marketplace offers flexible space for events, arts and craft vendors, food stalls and art exhibitions. The market is located at 5925 NE 2nd Ave., Miami, Florida 33137. Call 305-960-2969 or email lhcc@miamigov.com for more info. Join Brian Mazza & 1 Hotel South Beach for a weekend full of workouts! Each session is completely complimentary. The incredible workout classes will take place Friday March 9th to Sunday March 11th. Come one, come all, bring a guest, and sweat! RSVP to attend. Please make sure to specify which workout you would like to do. Please arrive 15-20 minutes before start time to get everything set up. The 2018 TaxAct Mobile Tour is coming to Miami! Members of the public can stop by a pop-up event celebrating freelancers, with free specialty coffee, dishes from local food trucks, and demonstrations of TaxAct’s new mobile app on offer. Attendees will also be treated to musical entertainment from Eyal Agai of Slap & Tickle Miami, and a talk by guest speaker Sarah Akiba, a life and fashion stylist from Paris who is based in Miami. TaxAct will also provide helpful tax tips for all those filing a 1099 this year, and give attendees a voucher for free e-filing with TaxAct solutions. Catch John McNutt perform live at the Hard Rock Cafe in Hollywood, FL on Feb. 9-10, 2018. Enjoy half-priced drinks available at the bar and lounge during Happy Hour on Fridays and Saturdays from 10 p.m. to midnight at Hard Rock Cafe. “#33rd_International_Conference_on_Dental_and_Oral_Health” welcomes all the speakers, delegates (both from academy and business) sponsor’s and other research expertise at Dubai, UAE held during August 13-14, 2018. This conference provides beautiful platform for Dental as well as business networking and luxurious stay at Dubai. Regulatory and Ethical Issues of Dentistry. Kindly submit your abstract if you want to attend as a Speaker. It would be great if you are willing to attend the Congress kindly contact us at the earliest. For further queries kindly revert to us, we will be very happy to assist you all the time. #MiamiWalks: Arts & Culture On the Move! During the Miami Downtown Development Authority‘s annual Art Days Weekend 2017, residents of all ages throughout greater Miami are invited to experience the global walking movement called Jane’s Walk. On Saturday, Oct. 14th neighborhoods within the Miami DDA’s boundaries – including Brickell, Downtown, and Omni – are going to feature several free, citizen-led walking tours where attendees can actively connect with friends and neighbors outdoors, while engaging in conversations with one another and learning more about the ways arts & culture have and will impact the area. These kind of walks, inspired by a writer and activist from the 1960s named Jane Jacobs, have engaged tens of thousands of people all over the world in 200+ cities since 2007. Earlier in 2017 Jane’s Walk (aka #MiamiWalks) held 7 unique walking tours across Miami which 75+ residents attended, and we’re looking forward to meeting lots of new people! Decades Rewind is a National touring concert, dance party and theatrical performance all wrapped up in one blockbuster show! It celebrates the hits of the 60s, 70s and 80s, the most prominent decades in music history. Disco, Funk, Rock and Motown all take center stage in this brand new theatrical concert featuring over 60s songs, 100 costume changes and nostalgic video. From Aretha to Zeppelin, Decades Rewind will have you singing and dancing in the aisles. This IS the story of your life! Show your children your life at their age through music. Children FREE with each adult ticket purchase, through box office only. Explores the rise and fall of the Jewish population of Miami Beach over the past 100 years, including a look at the impact of selected key Jewish individuals and institutions, plus an overview of architectural styles in the southernmost part of the city. Tour departs in front of the Art Deco Welcome Center, 1001 Ocean Drive, on the 2nd Sunday of each month starting at 11am.